I found this advertising card published by Postverkets Tryckeri in 1975 at a stamp show over the weekend, featuring Swedish stamps around the Arctic Circle. On the top left on the card, a 70 Swedish öre stamp, issued on January 18, 1973, shows a mail truck; on the top right, a 35 Swedish öre stamp, circa 1967, features a painting of the Fjeld by Sixten Lundbohm, The Swedish fjelds, explains the difference between fjelds and mountains. In the middle row, two 45 Swedish öre stamps, showing a lappkata (teepee) on the left and a reindeer herd on the right, are two of the five stamps from the Around the Arctic Circle set, circa 1970. At the center, a 35 Swedish öre stamp features a view of the Akka Mountains in the Stora Sjöfallet (Great Falls) National Park, circa 1970. 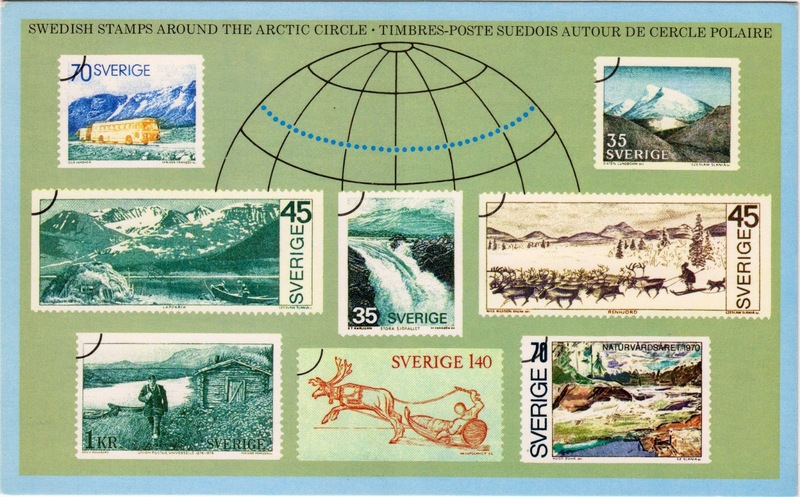 At the bottom on the left, a 1 Swedish krona stamp, circa 1974, features a Swedish overland postman on his northernmost rural delivery route against the background of Scandinavian landscape. Next to it, a 140 Swedish öre stamp, circa 1970, shows a a sled drawn by a reindeer. On the right, a 70 Swedish öre stamp commemorates the European Nature Conservation Year in 1970. The set contains two similar stamps featuring the River Trångforsen in Ljungan, Jämtland, but with different face values. The other stamp has a face value of 55 Swedish öre. Öre is the discontinued centesimal subdivision of the Swedish krona. 1 KR = 100 öre. On the back of the card, a tag line reads "Collect Swedish stamp motifs. Ask your dealer for Swedish Stamps."